OBTL is focused not on what the teacher intends to teach but rather the emphasis is on what is the outcome from the learner of that teaching is intended to be. The basic premise of OBTL is that the teaching and learning activities (TLAs) and assessment methods (AMs) are constructively aligned (Figure 1) with the intended learning outcomes (ILOs) for the course. In other words, the outcomes determine the curriculum content, the teaching methods and strategies, and the assessment process. The outcomes also provide a framework for curriculum evaluation. OBTL, at the course/micro level, expects constructive alignments between the ILOs, TLAs and AMs such that the learners know what is expected of them (ILOs); be facilitated to achieve the set outcome via well-structured TLAs and be properly assessed for competency in achievement of said ILO via suitable AMs. 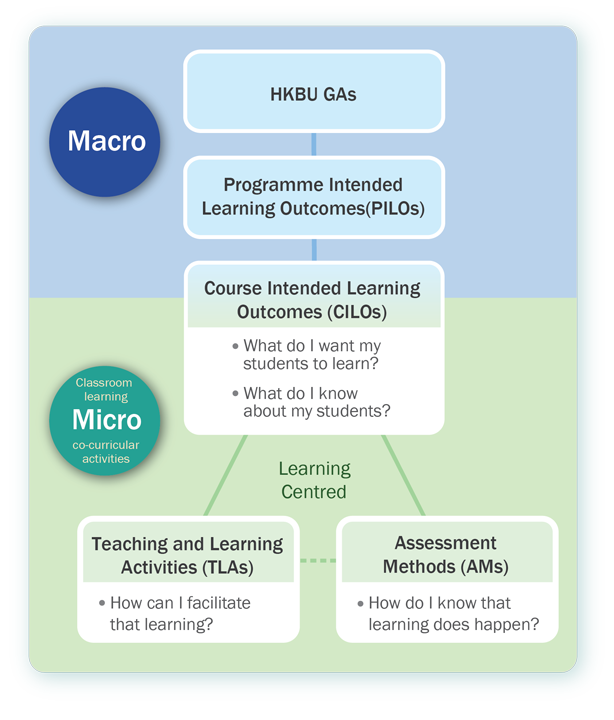 At the macro level, the course ILOs are also constructively aligned to the Programme ILOs, where therein are aligned to the HKBU Graduate Attributes such that the learner can achieve these attributes at graduation. Assessment is an integral part of learning and teaching. Student understanding of the assessment process is facilitated by clear explanations of the assessment tasks, how the assessment tasks relate to the learning outcomes, and the criteria and standards against which students will be assessed. Criterion-reference assessment (CRA), a tenet of OBTL, is the process of evaluating (and grading) the learning of students in which preset criteria are used as benchmarks against which to measure the quality of performance that will show that a student has reached a particular standard (See “Use of Rubrics” in Section 3 below). When CRA is implemented well, teaching, learning and assessment is aligned and assessments of students’ achievements are more valid and reliable. The implementation of CRA at HKBU achieves fundamental benefits for all students and staff including clearly articulating the criteria and standards used to assess the quality of students’ work and improving students learning outcomes. 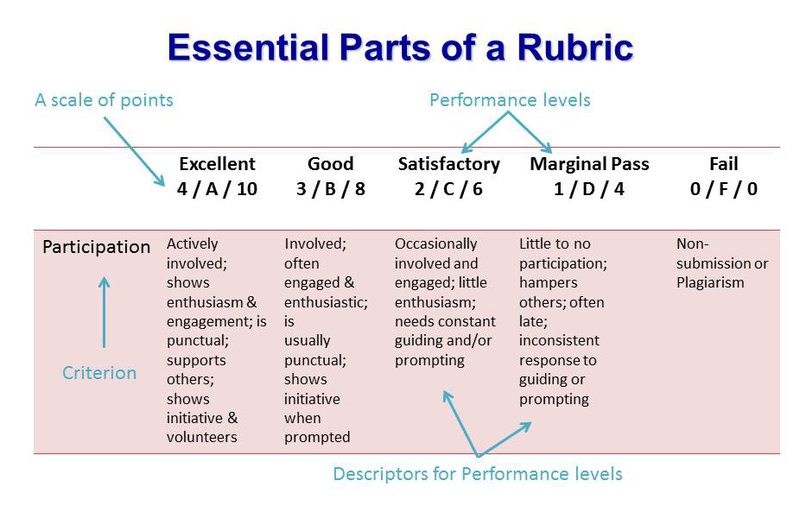 Developing rubrics helps clarify expectations for student performance and comprises of criteria and descriptors matched to levels of achievement or grading scale, presented in a format such as a table or matrix (Figure 2). Once the criteria for a performance are clearly defined, an instructor can align the course with the criteria to help students meet the requirements. Hence, the use of rubrics not only helps to specifically and consistently assess and evaluate qualities of learning but also communicates expected standards of learning. Moreover, rubrics help students interpret their own levels of performance, learn what must be done to improve performance and subsequently achieve higher standards of performance. The examples provided (http://chtl.hkbu.edu.hk/main/resources/rubrics/) are for teaching staff who may be considering some of the ideas as starting points and sources of ideas in developing their own grading rubrics.